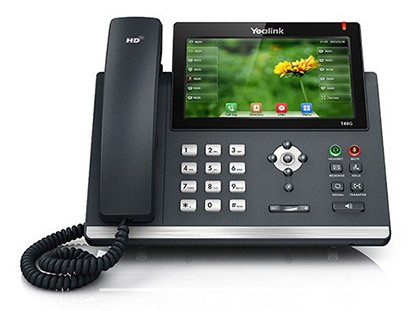 The Yealink SIP-T48G is by far the most impressive SIP phone of its class. It has a 7 inch, HD full color screen, 10 touch screen keys as well as touch screen call log, directory, DND, menu, and other programmable features. As always, the T48G features Yealink’s HD audio, which is by far the highest quality sound available to a SIP phone. The SIP T48G is the most impressive looking executive SIP phone for business of its class. With a 7 inch touch screen, 10 line keys programmable with 7 different features, and a touch screen menu, directory, call history, DND, and more. Not only does the SIP T48G look impressive, its features and functionality match is aesthetics. This phone features Yealink’s Optima HD Audio, HD handset and HD speakerphone, and has the USB 2.0 dongle capability that allows you to expand its features to Bluetooth, WiFi, and flash drive functionality. The HD handset and HD speakerphone included with the SIP-T48G provide clearest audio communications available to any line of SIP phones on the market. An included USB port on the SIP T48G increases the phone’s functionality through the use of USB dongles. Use Bluetooth, Wi-Fi, and USB recording features with ease.